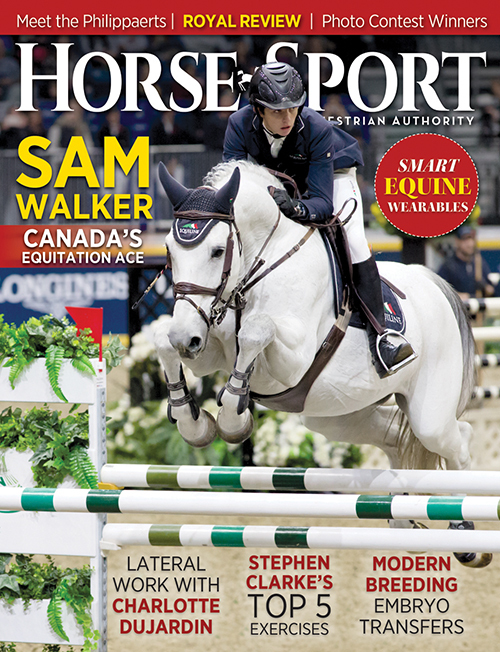 Sam Walker (shown on our February cover aboard Acardi du Houssoit) took the 12th annual George H. Morris Excellence in Equitation Championship at WEF riding Waldo. Sam Walker of Nobleton, ON, piloted Missy Clark’s and North Run’s Waldo to the win in the 12th Annual George H. Morris Excellence in Equitation Championship. Forty combinations of young equitation athletes and their mounts took to the International Arena at the Palm Beach International Equestrian Center on the evening of Friday, March 22, at the 2019 Winter Equestrian Festival (WEF). Elli Yeager collected second place, Sophee Steckbeck was third, and Emma Fletcher rounded out the top four. Cent 15, owned and shown by Dominic Gibbs, received the award of Best Turned Out Horse during the night, his groom Mario Jaime received an Equiline “Sandy” embroidered jacket and embroidered “Nathan” rain jacket.